Simple things make good illustrations. Just ask Jesus. David used many simple illustrations in the Psalms. In one he spoke of the common piece of broken pottery (potsherd) which could be found around every home and camp site. In this text David describes his own feeling of weakness and/or that of the coming Messiah. There are times, I think, when each of us feels like this. A common thing we see at archaeological digs is a pile of potsherds from ancient times. Archaeologists relish an unbroken piece of pottery, but even the sherds or potsherds reveal a lot about the age of the stratum being worked and the life of the ancient people. 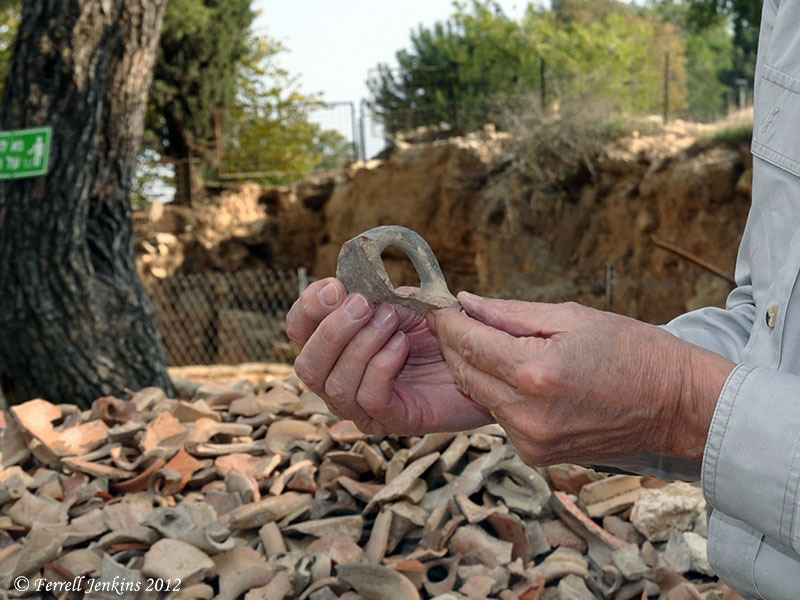 The broken jar handle from Ramat Rachel, south of Jerusalem, tells its own story. Potsherds Potsherds at Ramat Rachel excavation. Photo by Leon Mauldin. Unless it is an old college professor (pick your own), nothing is drier than a piece of broken pottery. Great illustration. This entry was posted in Archaeology, Bible Study, Culture, Israel, Old Testament, Photography, Travel and tagged Psalms. Bookmark the permalink.